Today (Sun., August 31, 2014), TSM Plug rolls on with our 2014 NFL divisional schedule analysis, and right now we’ll be focusing on the AFC South. The AFC South appears to be one of the weaker divisions in the league on paper, but the teams do have some young talent that could make 2014 a very interesting season. 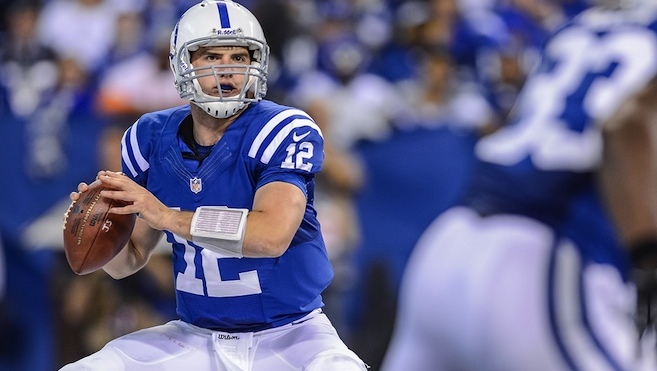 With quarterback Andrew Luck and the Colts set to win the division with relative ease, let’s break down each team’s schedule for 2014. After winning the AFC South last year, the Colts should be the overwhelming favorite to repeat in 2014. They’ll head into Denver to take on the Broncos in their opening game, but their schedule falls off considerably after that. They have the weakest schedule in the league per ESPN, and with Luck coming into his own as a true star, the Colts should be poised to take their game to the next level this year. They don’t have any away games that stick out as overly difficult. Week 1: Sunday, Sept. 7, at Denver, 8:30 p.m.
Week 2: Monday, Sept. 15, Philadelphia, 8:30 p.m.
Week 3: Sunday, Sept. 21, at Jacksonville, 1 p.m.
Week 4: Sunday, Sept. 28, Tennessee, 1 p.m.
Week 5: Sunday, Oct. 5, Baltimore, 1 p.m.
Week 6: Thursday, Oct. 9, at Houston, 8:25 p.m.
Week 7: Sunday, Oct. 19, Cincinnati, 1 p.m.
Week 8: Sunday, Oct. 26, at Pittsburgh, 4:25 p.m.
Week 9: Monday, Nov. 3, at NY Giants, 8:30 p.m.
Week 11: Sunday, Nov. 16, New England, 8:30 p.m.
Week 12: Sunday, Nov. 23, Jacksonville, 1 p.m.
Week 13: Sunday, Nov. 30, Washington, 1 p.m.
Week 14: Sunday, Dec. 7, at Cleveland, 1 p.m.
Week 15: Sunday, Dec. 14, Houston, 1 p.m.
Week 16: Sunday, Dec. 21, at Dallas, 4:25 p.m.
Week 17: Sunday, Dec. 28, at Tennessee, 1 p.m. The Texans were supposed to be a Super Bowl contender in 2013, but instead they imploded and finished 2-14, resulting in the firing of former head coach Gary Kubiak. 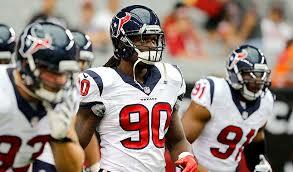 They signed new coach Bill O’ Brien away from Penn State and drafted phenom defensive end Jadeveon Clowney with the first pick in May’s draft. They don’t have any glaringly hard away games except for a trip into Indianapolis, and like the Colts, they should benefit from one of the worst schedules in the league at No. 30. If they can get some consistency at quarterback from newly signed Ryan Mallett, whom they just obtained from the New England Patriots today, the Texans could come back strong in 2014. Week 1: Sunday, Sept. 7, Washington, 1 p.m.
Week 2: Sunday, Sept. 14, at Oakland, 4:25 p.m.
Week 3: Sunday, Sept. 21, at NY Giants, 1 p.m.
Week 4: Sunday, Sept. 28, Buffalo, 1 p.m.
Week 5: Sunday, Oct. 5, at Dallas, 1 p.m.
Week 6: Thursday, Oct. 9, Indianapolis, 8:25 p.m.
Week 7: Monday, Oct. 20, at Pittsburgh, 8:30 p.m.
Week 8: Sunday, Oct. 26, at Tennessee, 1 p.m.
Week 9: Sunday, Nov. 2, Philadelphia, 1 p.m.
Week 11: Sunday, Nov. 16, at Cleveland, 1 p.m.
Week 12: Sunday, Nov. 23, Cincinnati, 1 p.m.
Week 13: Sunday, Nov. 30, Tennessee, 1 p.m.
Week 14: Sunday, Dec. 7, at Jacksonville, 1 p.m.
Week 15: Sunday, Dec. 14, at Indianapolis, 1 p.m.
Week 16: Sunday, Dec. 21, Baltimore, 1 p.m.
Week 17: Sunday, Dec. 28, Jacksonville, 1 p.m.
With a ton of question marks on offense, the Titans are sandwiched between Indianapolis and Houston with the second easiest schedule in all of the NFL. 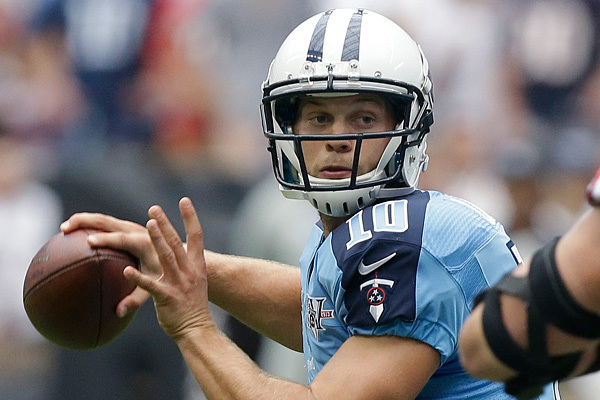 This will probably be quarterback Jake Locker’s make-or-break year in Tennessee, so he has to put on a very impressive performance if he wants to keep his job. They have some tough away games at Cincinnati, Indianapolis, and Philadelphia, but that’s about as hard as it gets. Like the rest of their AFC South divisional rivals, it doesn’t get much easier on paper. Whether or not Tennessee can capitalize remains to be seen. Week 1: Sunday, Sept. 7, at Kansas City, 1 p.m.
Week 2: Sunday, Sept. 14, Dallas, 1 p.m.
Week 3: Sunday, Sept. 21, at Cincinnati, 1 p.m.
Week 4: Sunday, Sept. 28, at Indianapolis, 1 p.m.
Week 5: Sunday, Oct. 5, Cleveland, 1 p.m.
Week 6: Sunday, Oct. 12, Jacksonville, 1 p.m.
Week 7: Sunday, Oct. 19, at Washington, 1 p.m.
Week 8: Sunday, Oct. 26, Houston, 1 p.m.
Week 10: Sunday, Nov. 9, at Baltimore, 1 p.m.
Week 11: Monday, Nov. 17, Pittsburgh, 8:30 p.m.
Week 12: Sunday, Nov. 23, at Philadelphia, 1 p.m.
Week 13: Sunday, Nov. 30, at Houston, 1 p.m.
Week 14: Sunday, Dec. 7, NY Giants, 1 p.m.
Week 15: Sunday, Dec. 14, NY Jets, 4:05 p.m.
Week 16: Thursday, Dec. 18, at Jacksonville, 8:25 p.m.
Week 17: Sunday, Dec. 28, Indianapolis, 1 p.m.
Perennial cellar dweller Jacksonville took a big step towards improving by selecting quarterback Blake Bortles with the No. 3 pick in May’s draft. 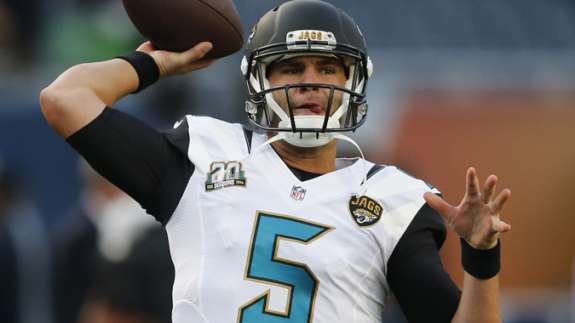 He’s set to begin the season behind veteran Chad Henne on the Jags’ depth chart, but as the future of the franchise, he could be starting sooner than later. When he does, he’ll enjoy the 29th-hardest schedule in the league. Trips to Philadelphia, San Diego, Kansas City, and Indianapolis, and Baltimore won’t be easy, but the Jaguars couldn’t ask for a much easier of an easy schedule overall. Week 1: Sunday, Sept. 7, at Philadelphia, 1 p.m.
Week 2: Sunday, Sept. 14, at Washington, 1 p.m.
Week 3: Sunday, Sept. 21, Indianapolis, 1 p.m.
Week 4: Sunday, Sept. 28, at San Diego, 4:05 p.m.
Week 5: Sunday, Oct. 5, Pittsburgh, 1 p.m.
Week 6: Sunday, Oct. 12, at Tennessee, 1 p.m.
Week 7: Sunday, Oct. 19, Cleveland, 1 p.m.
Week 8: Sunday, Oct. 26, Miami, 1 p.m.
Week 9: Sunday, Nov. 2, at Cincinnati, 1 p.m.
Week 12: Sunday, Nov. 23, at Indianapolis, 1 p.m.
Week 13: Sunday, Nov. 30, NY Giants, 1 p.m.
Week 14: Sunday, Dec. 7, Houston, 1 p.m.
Week 15: Sunday, Dec. 14, at Baltimore, 1 p.m.
Week 16: Thursday, Dec. 18, Tennessee, 8:25 p.m.
Week 17: Sunday, Dec. 28, at Houston, 1 p.m.